The VITA program offers free tax help to households with incomes of $55,000 or less. 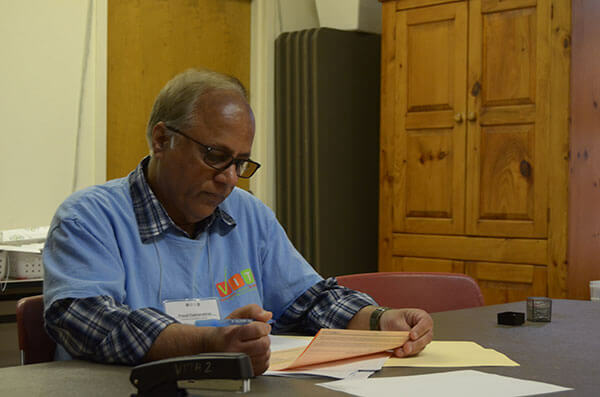 IRS Certified volunteers will prepare tax returns for the current year on Saturdays during the tax season at the Center for Legal and Social Justice, 2507 NW 36th St., San Antonio, Texas 78228. The St. Mary’s site operates Saturdays only from Jan. 26 through April 6 from 9 a.m. to 4 p.m. with no appointment needed. Returns are prepared on a first come, first served basis. For new volunteers, participation in the VITA program requires one day of basic training to teach proper tax software usage and how to apply basic tax laws to real-life client scenarios. Prior tax or accounting knowledge is helpful but is not required. At the VITA website, you will first register as a New User, provide basic demographic information and log out. Then, log back in as a Returning User and select a basic training session. Volunteers with previous VITA experience must also first register at the VITA website as a New User, provide demographic information, then log out and log back in as a Returning User. As an experienced volunteer, you may sign up directly for advanced training and need not complete the basic training, unless you choose to do so. The advanced training session is designed to refresh an experienced volunteer on the VITA basics and provide preparation to handle advanced situations when working at the VITA site. Training begins at 9 a.m. and finishes at 5 p.m. Training materials, as well as snacks, light meals will be provided. All training occurs in the Albert B. Alkek Business Building at St. Mary’s University. Jan 11, 2019 — Basic: Alkek, Room 107. Advanced: Alkek, Room 108. Jan. 12, 2019 — Basic: Alkek, Room 107. Advanced: Alkek, Room 108. Jan. 18, 2019 — Basic: Alkek, Room 107. Advanced: Alkek, Room 108. Jan. 19, 2019 — Basic: Alkek, Room 233 (space limited to 35). Advanced: Alkek, Room 108. Jan. 26, 2019 — Basic: Alkek, Room 107. Advanced: Alkek, Room 108. If you are interested in volunteering in the VITA program, please contact vitavolunteer@stmarytx.edu. During the spring 2017 tax season, the IRS received 698 tax returns (as of April 17, 2017) from the St. Mary’s University VITA site. The St. Mary’s site conducted operations each Saturday during the tax season, mid-January through mid-April, at the Center for Legal and Social Justice and conducted several special tax preparation sessions at the University Center for international students. Participants included St. Mary’s students, faculty, staff, alumni and community volunteers. 109 participants worked for a total of 1,823 hours during site operations. The Greehey Scholars also volunteered on Tuesday afternoons to help students learn how to file their own tax returns and to help international students with returns and other forms that must be filed to satisfy their visa requirements. This resulted in the preparation of an additional 127 returns not included in the IRS totals. The St. Mary’s VITA Program, which began in 2003, is a joint effort of the Greehey School of Business and St. Mary’s Law School and is under the direction of Tom Madison, Ph.D., CPA, Associate Dean and Professor of Accounting, and Professor of Law and Clinical Professor of Law and Director of Clinical Education, Karen Kelley. Volunteers at the site include St. Mary’s students, faculty and staff, alumni and community members. The site is also supported by Wells Fargo and the IRS.